Galveston Island’s early history meets the high speed technology of today’s mobile applications with the launch of Galveston Historical Foundation’s “Make History!” app. The mobile app, free to download, comes pre-loaded with a Strand walking tour and numerous other special features. The tour allows users to go on a self-guided walk through downtown Galveston, learning about the history of notable buildings and viewing archival images of the Strand and its buildings. The app will also feature tours, added quarterly and available for an additional fee, focusing on a variety of topics and locations. 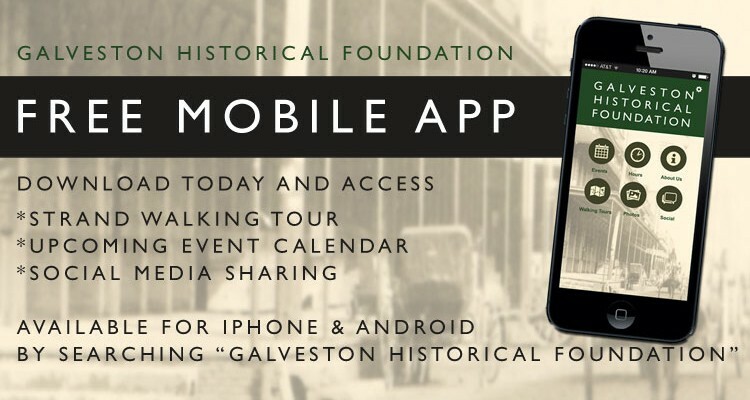 In addition to the pre-loaded tour, the app features access to information on upcoming GHF events, hours of operations for all Foundation properties and attractions, access to the @galvestonhistory Instagram photo feed and integration with Facebook and Twitter social media accounts. I am excited to try this app our during our visit to Galveston next week. Where’s the app? Can’t find it in the iTunes Store. We are in the process of updating our mobile app and should have it completed in the next month. Antiques Warehouse is a separate business from GHF. You can reach them directly at (409) 762-8620.